Now you can have luscious lawn all year-round! Thanks to Artificial Style’s artificial grass services, you won’t have to deal with ever increasing water bills and mowing.We have been and will always be ready to meet and even exceed your expectations. We’ve installed outstanding artificial lawns for many residential clients around Dorset, Hampshire, Bournemouth, Poole, and surrounding areas. You won’t worry about muddy paws and dirt inside your home. Let Artificial Style install artificial grass for dogs, and your pets won’t be able to dig up dirt anymore. We create highly durable artificial lawns as we source materials from UK’s leading synthetic turf manufacturer. Our artificial turf may look and feel natural but you can easily hose off or even brush away solid wastes. Now your children and pets can enjoy playing on your lawn regardless of the season. If you’re dreaming of transforming your barren garden into a residential Eden, Artificial Style’s team is what you need. We have the landscaping talent and expertise to design whatever type of lawn or back garden you can imagine. Whether it’s for a back garden front garden, driveway or roof garden, we can bring all the texture, color, and fragrance that will induce energy and excitement around any residential area. Maintaining natural lawns can be tedious and expensive. Choose Artificial Style to create your artificial lawn and you won’t have to worry about your water bills or mowing. Artificial grass carpets can independently thrive on any surface—roof gardens, terraces, balconies, or gardens. So if you want to have the best lawn on the street without spending without breaking the bank, contact Artificial Style now. We assure you that we’ll provide absolute satisfaction from start to finish. We also install artificial grass for play areas, schools, commercial areas, and more. 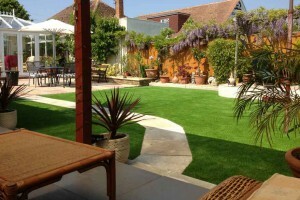 For the best residential artificial grass installers in Dorset, Hampshire, Poole, Bournemouth, and surrounding areas, contact Artificial Style at 01202 620996 or 07783 374222. You can also fill out the form from our Contact Page, and we’ll get back to you as soon as possible.